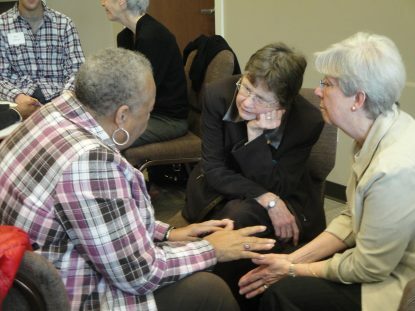 As part of its “Conversations that Matter” series, Cranaleith Spiritual Center will present a Jan. 26 workshop on the practice of listening. The seminar will be facilitated by Sharon Browning, director of Just Listening for the Common Good. Browning’s organization stresses that listening is in itself a transformative act of justice. The morning is designed to provide participants with enhanced communication skills, emphasizing both self-reflective and other-centered listening. During the afternoon session, Susan McCrary and Candice Harris will share their experiences as women in the United States facing work, family, and cultural pressures amidst the challenges of deeply ingrained sexist and racist attitudes and behaviors. By the end of the day, participants will be able to identify core personal and social impediments to listening; gain essential listening and speaking skills; practice compassionate, “ego-less” communication; converse with women and men from various backgrounds and circumstances. The seminar will begin at 10 a.m. and conclude at 3 p.m. Cost: $45 per person, which includes lunch. Some scholarship assistance is available. In case of snow, the seminar will be rescheduled for Feb. 2, 2019.